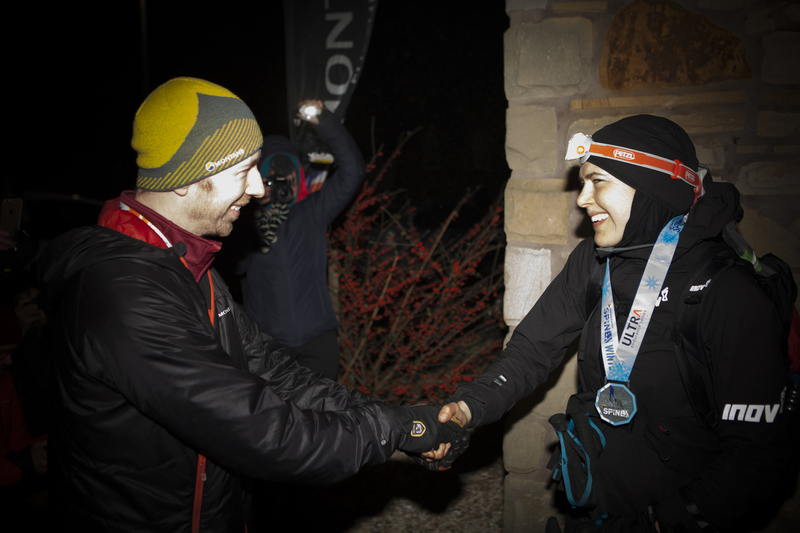 Kirk Yetholm, Scotland, United Kingdom, Wednesday, 16 January, 2019: As the MONTANE® Spine® Race enters its forth night, Jasmin Paris completes another historic victory. I can think of no other ultra race, that captured the interest of so many as this year’s Spine, when Jasmin first ran with Eugeni and Eoin, before pushing on ahead solo. Capitalising on her strategic decision 194 miles into the race to go it alone, Jasmin’s endurance and mountain craft was abundant, with records such as the Bob Graham Round and Ramsay Round to her name. Not only was she the first woman to win the Spine Race outright, but she also decimated the current overall course record, set my Eoin Keith in 2106. Traversing the Pennine Way and setting a new course record of 83h 12m 23s, shaving off over 14 hours off the pervious overall record. inov-8 athlete, Paris (35), arrived at the finish of Britain’s most brutal race at 7.12 p.m. yesterday evening, almost 10 miles in front of 2013 MONTANE® Spine® Race winner, Eugeni Roselló Solé (ESP), who subsequently was withdrawn with 6km to go by the safety team . Eoin Keith (IRL) finished in 2nd place (1st male) and John Napp took 3rd overall (2nd male). Jasmin has achieved what some will have thought impossible, what others closer to the sport know is a possibility. There are increasing numbers of women winning races outright, most commonly ultras from 100 miles and up. Looking deep into my forgetful memory, this is the highest profile victory of its kind on UK soil and has rightly received a lot of press attention. Will we soon see categorisation by gender, fall to a simple 1,2,3? Who knows. Will Jasmin’s attitude inspire other women and mums to take up challenges and join the ultra running community? I hope so. But remember, the Montane Spine Race is very much still alive, the vast majority of the runners are under another cold, bleak, desolate and isolate night. The race isn’t over just yet.